Miami Marlins owner Jeffrey Loria may have shared a few minutes with agent Scott Boras the other day, but that doesn't mean the team is getting involved in the pursuit of Prince Fielder, the Fort Lauderdale Sun-Sentinel reports. There is another player, though, that the Marlins are prepared to go after hard: Yoenis Cespedes. 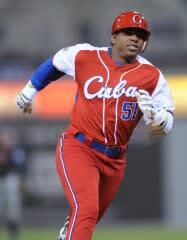 Cespedes, who left Cuba earlier this offseason, started playing winter ball in the Dominican Republic Thursday, and Marlins president David Samson told a local radio station that the team is ready to go after him once Cespedes becomes a resident of the Dominican and the league gives him free-agent status, the paper reports. "Aggressive right to the point of stupidity, but not quite there," Samson told the station, according to the Sun-Sentinel. "We think he's a perfect fit for us, but it has to be sane. [We're] expressing interest, going to visit, making it very clear to his representatives and to him and his family that we think he should not be anywhere other than Miami. As a Cuban and someone in the DR, it makes perfect sense. We have a perfect position for him to play. It would be great." Of course, the Marlins won't be alone in the pursuit of Cespedes. The Detroit News has it that the Detroit Tigers are interested and that six or eight teams will "bid exorbitantly" to try and get the outfielder. Other teams interested, according to the News, include the Baltimore Orioles and Chicago Cubs. "The Yankees might also decide to open their coffers for the right to sign Cespedes to a multi-year contract," the paper notes. Let the rumors come to you. Follow Scoop du Jour on Twitter or Facebook.